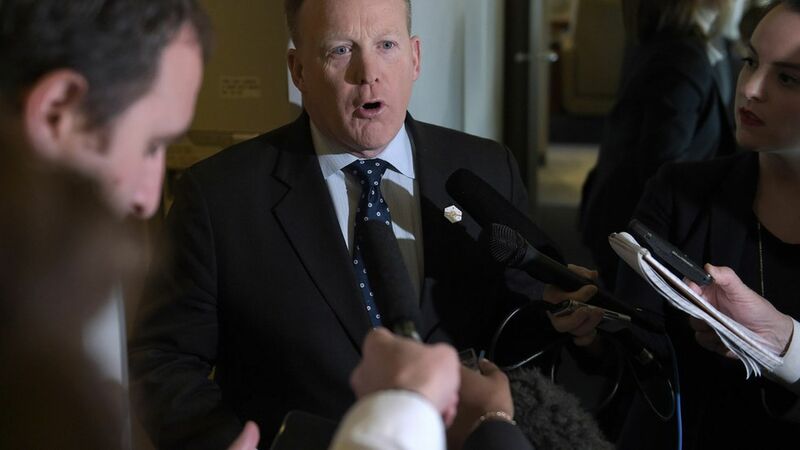 Sean Spicer had a quick gaggle with reporters on Monday as Trump flew home from Florida. He told them that Trump was "absolutely not" going to cancel the immigration executive order, and that they're not rethinking their strategy "at all." Quote"Once we win the case, it will go right back into action." When asked for examples of terrorist attacks that were "under reported," Spicer promised a list later. And when asked for evidence of jihadis "pouring in" to the country, he said, "I'm not going to get into specific information that the president has." Said the media is doing a lousy job covering the president; "a lot of those stories and success that he's had – in a mere two and a half weeks in office – aren't exactly covered to the degree to which they should be." Pushback on stories saying Trump isn't in charge at the White House: "When it comes to decisions and policy, it's the president who leads. The president tells us how to implement it."